Wacky Watercooler Blog Hop: October Holiday Round Up! We’ve gotten to that time of the year when we have holidays and other special days coming up fast. To reflect that this month we’re doing a no holds barred round up. Each designer is on their own to add their own touches to that idea. With our talented designers I know you’ll see something to inspire you to get stamping as deadlines are fast approaching. Hopefully you’ve arrived from Gail’s blog. Gail never fails to come up with fun and interesting projects that always land on my CASE list! Can’t wait to go back and see which of her wonderful projects I’ll be making next! You can’t get much more simple or as snowy as this Wonderland card. Wonderland is one of my favorite stamp sets from the Holiday Catalog. This was the card I showcased at last Saturday’s Stamp and Stack and quite a few there also liked how quickly and beautifully this design came together. While this particular card went with the Sahara Sand/Mossy Meadow version the Crumb Cake and Pear Pizzazz versions also with Mossy Meadow touches were just as lovely. Easy to mail since there are no embellishments and takes about 15 minutes to stamp and put together once you have the basic pieces cut. The stamp set has quite a few possible images too for the envelope and the inside of the card. 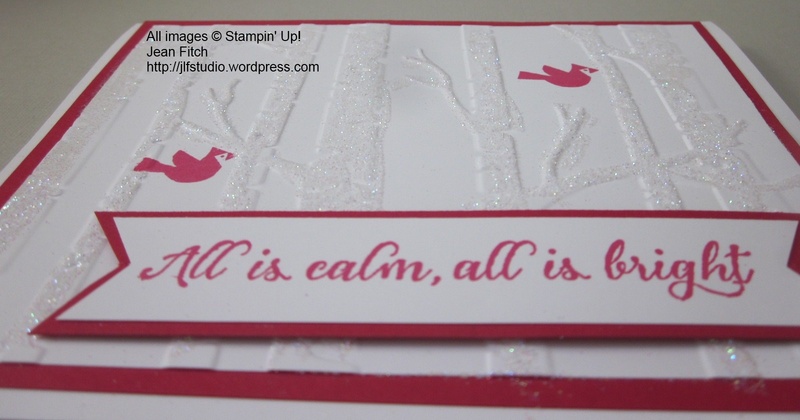 Next week I’ll share the dimensions and an instruction sheet from my Stamp a Stack (have to find where I put it! :D) as well as pictures of the other colors of cards. Ink: Mossy Meadow Classic Ink, Whisper White Craft Ink. Other: SNAIL , dimensionals, Sponge Daubers, Simply Scored Board. Here’s the card I’ve designed for friends who every year invite me to join them for Thanksgiving. Once again I reached into the Holiday Catalog’s bag of tricks (just had to get a Halloween reference in there since that’s fast approaching) to provide the special touches. This card makes use of the gorgeous new Winter Wonderland Designer Vellum Stack, Black Glimmer Paper and two of my favorite die sets: Seasonal Frame Thinlit dies (available bundled with the snow globe set Sparkly Seasons) and Square Pillowbox Thinlit Dies (also bundled with A Little Something stamp set). I don’t know about you but “grateful” is one of my favorite thoughts, die cut, and moods. I try so hard to be grateful all year long. And Thanksgiving gives me yet another season to express it. Several of the words come from a set you might expect to use only for Christmas. I wanted to show you that it has unlimited possibilities. 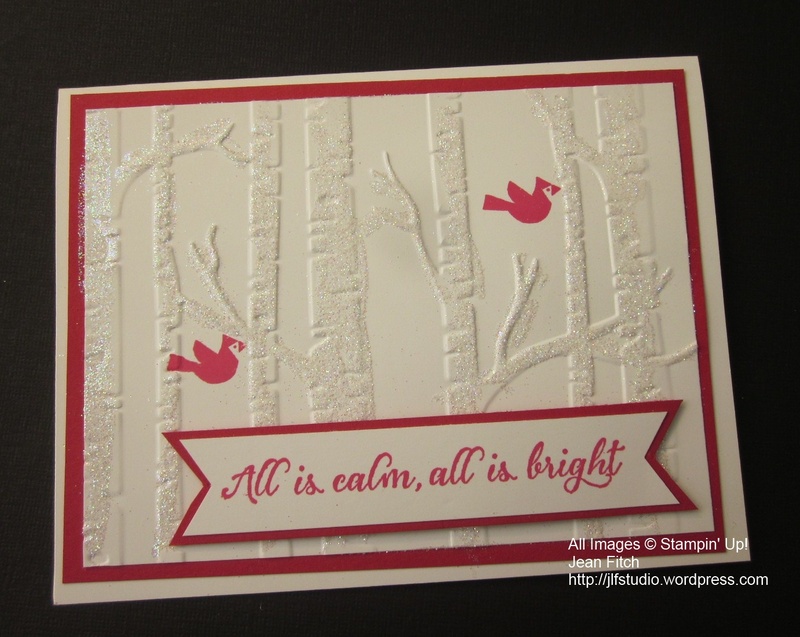 The general design idea is from a Christmas card shown by Pam Morgan at our Stampin’ Up 2015 Convention. She also showed a trick for wrapping the words around the dies. Pretty clever don’t you think? Place your die cut word on the table and set your other stamps around it rubber side down. Then just press your block to the stamps. 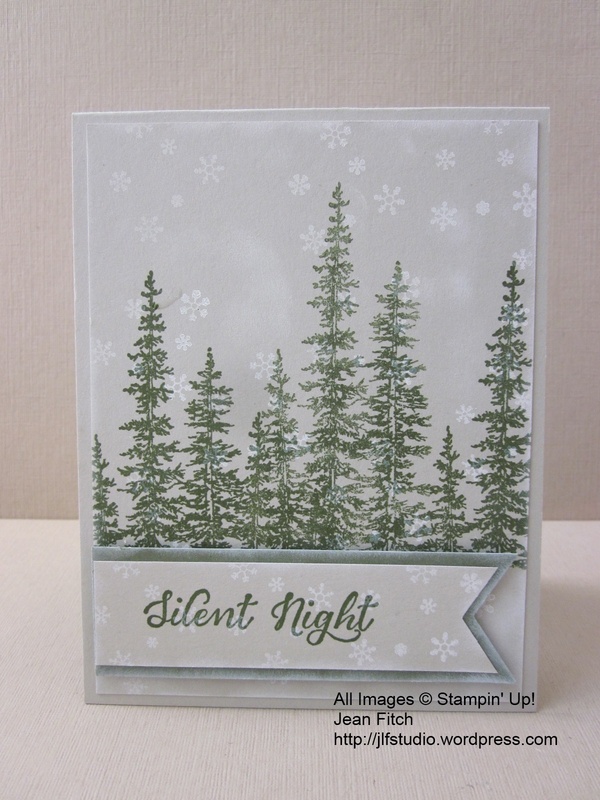 Every stamping will leave just the right amount of room for your die cut! Brilliant! With all the sparkle I just had to use the sentiment that included All is Bright as part of the line right? And yes…the paper is Whisper White…I just had trouble getting the camera to see it that way and still show the sparkle. Other: Big Shot, Woodland Embossing Folder, Dazzling Diamonds glitter, SNAIL, Two Way Glue Pen, , Glue dots or dimensionals. Simply Scored Board. I’ll have directions and dimensions for this one next week as well. I’ll also show you a slightly different version that stands in a different direction. I encourage you to play with these fun new products that I’ve show today. As you can see they coordinate with products you may already have or can find in the Annual Catalog. If you are behind on your Christmas Card making the two Christmas/winter cards shown are fast and easy. That’s it for my share of the hop. Time to move on over to Penny’s blog her wonderfully inspired creations are always ones that fill my CASE file too. Love your Wonderland card. That is a really useful stamp set. I hope it is around for a long time! You did really well with staying simple – yet with a WOW. Jean, I’m trying really hard to NOT buy the Wonderland stamp set – you’ve weakened my resolve! Gorgeous cards, all of them. You’ve done clean & simple very well, my friend! Hi Jean, your first card is my favourite. I love its elegance and simplicity. That Wonderland stamp set is a must-have! I’m going to have to remember that trick to wrapping words around a die-cut word. It sounds easy enough as long as the clear stamps stick. I imagine the sparkle of the last card is amazing. It’s too bad we can’t capture and share the sparkle as well on the screen. Thanks so much for sharing your projects for yet another terrific Watercooler Blog Hop. Such beautiful cards Jean, you’re always so creative. I know I’m going to be CASing the first and last ones for sure, I like the clean lines and that they are mail friendly. Thanks for the great tip on word wrapping around a die cut image, that makes so much sense. Such great cards, Jean. I love that Winter Wonderland vellum stack. So much can be done with it. The use of red and white in your sparkly card is so pretty. Your technique is much easier than the one I used in a class a week ago. Great idea and saves the mess created in the one I used. (we won’t go there). Beautiful cards Jean! I love the Winter Wonderland card. I may need to add that one to my wish list after seeing your card! Lovely cards, Jean! My favorite is the first one with all the trees. I’m going to have to break down and get that stamp set. I just love my enabling stamping friends! I had talked myself out of the stamp set used in the first card, but with this hope I’m rethinking that. Very nice cards Jean. It is so nice to see the new items from the Holiday catty. I am adding some to my wish list. Beautifully finished and I love your colors.